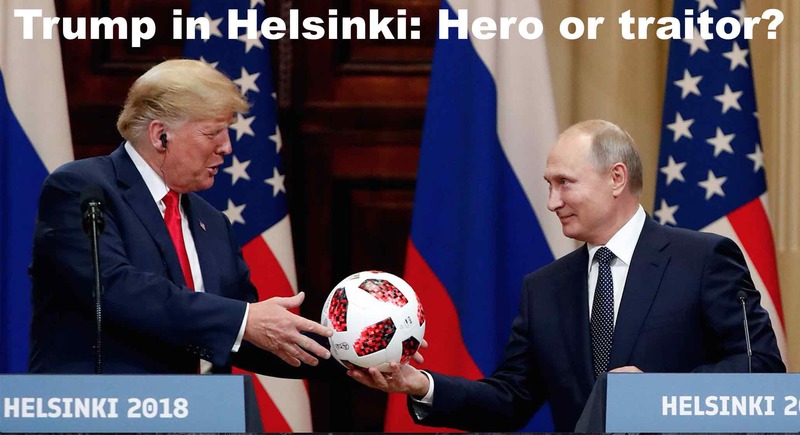 EXCLUSIVE BROADCAST: Trump in Helsinki: Greenhalgh vs. Fetzer! Second half hour: Is University of Minnesota Professor Emeritus Jim Fetzer “the most dangerous man in America“? Jim has managed to get himself and his books banned by Youtube, Amazon, etc. — so he must be doing something right. In this interview Jim says Paul Craig Roberts is right about the mainstream media’s witch-hunt against Trump’s supposed kowtowing to Putin. But Jim is not 100% sure that Trump is a peacenik, admitting that all the “kowtowing to Kim and Putin” could be in service to Bibi’s war on Iran. This show was broadcast on July 19, 2018. This entry was posted on Wednesday, July 18th, 2018 at 8:09 pm	and is filed under 9/11, Anti-War, Censorship-Propaganda, Death Squads, Disaster Capitalism, Education, False Flag/Fake Terror, Freedom, Geopolitics, Human Rights, Immigration, Kevin Barrett, Neoliberalism, News, Politics, Protest, Russian propaganda Russian hacking, War Crimes. You can follow any responses to this entry through the RSS 2.0 feed. I AM SO SICK OF HEARING ABOUT TRUMP, ALL DEBATES ON RT ETC.. ABOUT TRUMP AS IF NO ONE ELSE EXISTS IN OUR WORLD, AS IF ONLY THE USA COUNTS AND EVERYONE ELSE DOES NOT MATTER. AND WHAT REALLY IS THE USA NOW?? THE UNITED STATES OF ISRAEL!! BUT PEOPLE LIKE FETZER, OR BENNETT, STEELE AND THAT ROLF LINDGREN CANNOT SEE TRUMPS’ CONNECTIONS TO CHABAD LUBAVITCH WHICH IS A RED LINE FOR POLITICAL ANALYSTS. AM SICK OF PUNDITS WITH THEIR PROS AND CONS FOR TRUMP WHEN ALL HE IS, – IS NOT THE REAL PRESIDENT OR LEADER OF YOUR COUNTRY, BUT LIKE ALL OTHERS BEFORE HIM, HE IS A TOOL FOR THE JEWISH EMPIRE AND SAYS AND DOES WHAT HE IS TOLD. HE FOLLOWS THEIR POLICIES AND DECISION MAKING, AND HAS NO SAY IN THEM AT ALL. HE IS CONTROLLED, OWNED, GOVERNED, MANIPULATED, HANDLED BY THE CHABAD LUBAVITCH RABBINICAL CULT TO WHOM [LIKE PUTIN] HE ANSWERS TO BUT NO ONE DARES TALK ABOUT THAT, NOT HIS FAN BASE, NOT THOSE WHO PRETEND TO BE AGAINST HIM WHEN THEY KNOW FULL WELL THAT HE IS SERVING THE JEWISH AND ISRAELI ERETZ EMPIRE. ALL THIS PATHETIC SQUABBLING ‘AGAINST ‘ HIM IS JUST POLITICAL THEATRE, A ‘FAMILY FEUD’ WITHIN THE TRIBE. AT THE END OF THE DAY, IT IS ISRAEL AND THE JEWS WHO REIGN SUPREME.-NOT the shrewd buffoon, politically illiterate TRUMP, NOT THE USA. BUT JEWRY AND ISRAEL. I DESPISE THIS IMMORAL SEXUAL DEVIANT TRUMP AS MUCH AS I HATED ZIONISTS Israeli FIRSTERS- OBOMBA AND DRUGGED UP DUMBO BUSH- ALL TREASONOUS TRAITORS DOING THE OBEDIENT BIDDING OF THE FOREIGN ENTITY THAT OCCUPIES AMERICA AND DESTROYED ITS CONSTITUTION AND WHICH IS HOLOCAUSTING WITH IMPUNITY THE WHOLE OF THE MIDDLE EAST AND ISLAM ITSELF. Putin IS an ISRAELI friend and supporter as he is with Netanyahu. Both Putin and Trump are CHABAD Lubavitch AFFILIATES in full support of an Eretz Israeli Empire which means America needs to be brought down and the Americans like the Christian Zionist Extremists are allowing this to happen ads they erroneously believe it will bring their Rapture Day and Christ back! !